The Cell Phone Waiting Lots at Phoenix Sky Harbor International Airport are areas where drivers can wait in their vehicles, free of charge, while passengers deplane, pick up luggage, and walk out to the curb. Follow driving directions to the airport. Once you have arrived, locate one of three Cell Phone Waiting Lots. The Cell Phone Waiting Lot west of Terminal 2 is near the West Economy Lot. It includes signage with all the airline telephone numbers displayed. An electronic flight information display provides airline flight and arrival information. There are about 90 spaces there, as well as portable restrooms. 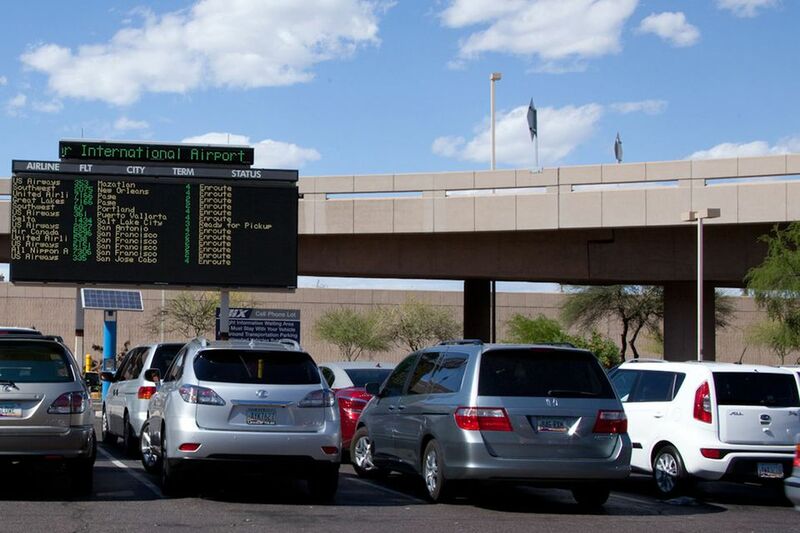 The Cell Phone Waiting Lot nearest to Terminal 4, the most active terminal at Sky Harbor, is east of the terminal. The lot has an electronic flight information display and signage with airline telephone numbers. There are about 90 spaces there, as well as portable restrooms. There is a Cell Phone Lot at the PHX Sky Train station at 44th Street and Washington. It is free to park there and wait for passengers who may take the PHX Sky Train to that station, but there are no electronic boards or signs about arriving flights. There are about 25 spaces there, as well as restrooms inside the station. The waiting areas are designed to be used for 30 minutes or less, and you must stay with your vehicle. Sky Harbor's Cell Phone Lots are easy to use, and they are free. The electronic boards will indicate when a flight has arrived. Keep in mind that flight arrival means that the airplane has arrived at the gate. It might take a while for passengers to deplane, get through the terminal, and retrieve luggage. It's best to arrange for incoming passengers to simply call your cell phone number when they have picked up their luggage and are ready to head out to the curb at the arrivals side of the terminal. It should only take you a few minutes to then leave the cell phone lot to pick them up.